The latest page in the second issue of the League of Legends community comic “Olaf vs. Everything” is here, revealing the outcome of Olaf and Warwick’s brawl and checking in on Ornn as he defends the Freljord. In case you missed it, take a moment to catch our recap of what happened in last week’s page. Part two illustrates Olaf after he wakes up in Illaoi’s house following a tavern brawl. The Kraken Priestess offers her help on the Berserker’s journey back home but throws him into a pit of skin universes as a challenge to prove his worth. The axe-wielding hero then comes face to face with Grey Warwick, challenging him in a fight on the streets of Zaun. Per the demand of an onlooking soldier, Olaf pulls the sword out of Grey Warwick’s back in hopes of defeating the beast. The sword has a mind of its own, however, and it kidnaps the Berserker, whisking him away into the night sky with a beam of luminous light. Left alone with Warwick, the soldiers celebrate Olaf’s victory, but their cheers are cut short as the beast towers over them. The hound’s alive, albeit without his sword, and the page ends with the fate of the soldiers left unknown. The page also revisits Thunder Lord Ornn, who was left on his own to defend the Freljord from impending doom in the issue’s first page. 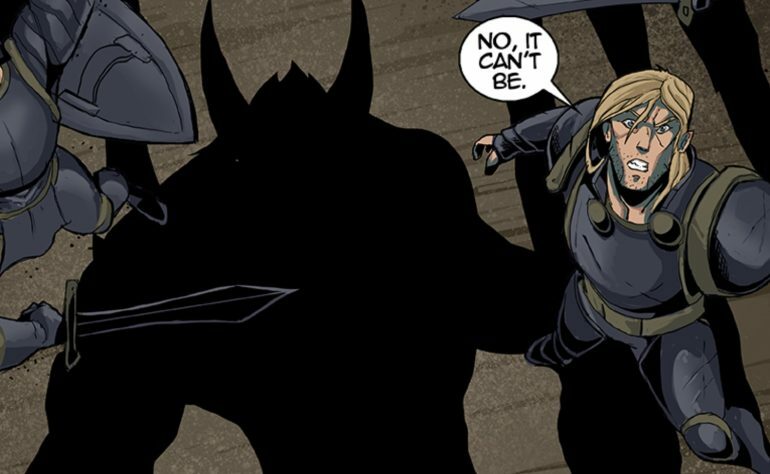 One of the panels in the comic’s newest page shows the legendary being as he’s hurt in his battle to defend the region, suggesting his power is waning. Where will Olaf wind up next? Will Ornn fall to the threatening force? What’s up with Warwick? Readers will (hopefully) have all of their questions answered as more pages are released every Monday.